Very good RPG/RTS hybrid strategy game with a lot of depth. Warlords Battlecry 2 plays out similar to other standard fantasy RTS fare, but there are quite a few new features and RPG elements to give the Battlecry series its own unique style. SSG decided to drop any pretense of story in the single-player campaign for this game compared to the original Battlecry. Some players may herald that decision, while others will be disappointed that there isn't a strong story to draw them into the Warlords universe. The game doesn't skimp on gameplay, however. There's more than you can shake a mouse at here. Gamers who have an eye for replay value should take a close look at all that is offered by WLBC2. 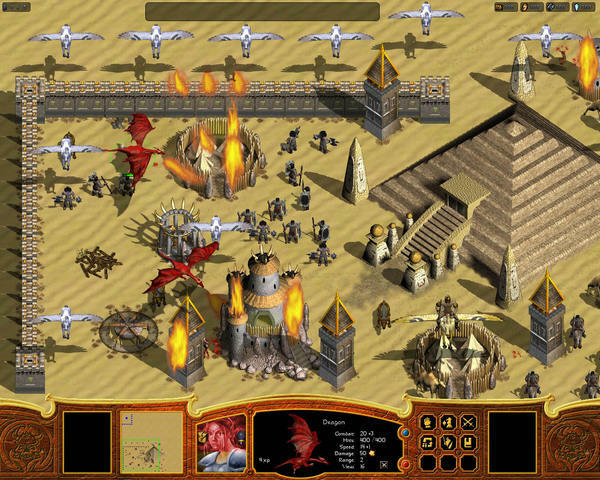 Serious RTS fans will be pleased with the variety and depth that the game offers. RPG fans who are interested in something different may appreciate the RPG elements while learning the strategic ropes. Each of the 12 unique fantasy races plays out very differently from the rest, and using the same tactics from one race to the next will likely yield disastrous results. For example, the Dark Dwarves specialize in powerful golem and siege machinery units, the Wood Elves concentrate on archery, while the Orcs have units that can disease or poison opponent units. The core of the game is the hero. A player will build his hero as he plays out battles. Heroes gain experience the more you play. You can upgrade your heroes with new abilities and improve their statistics as they gain levels. 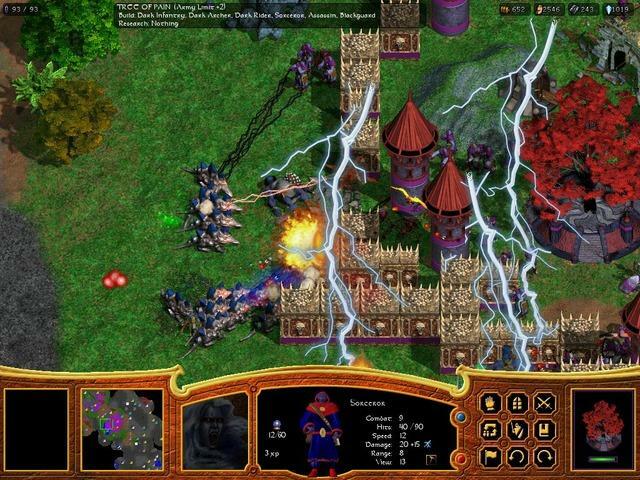 Player involvement in the game is focused through their hero. 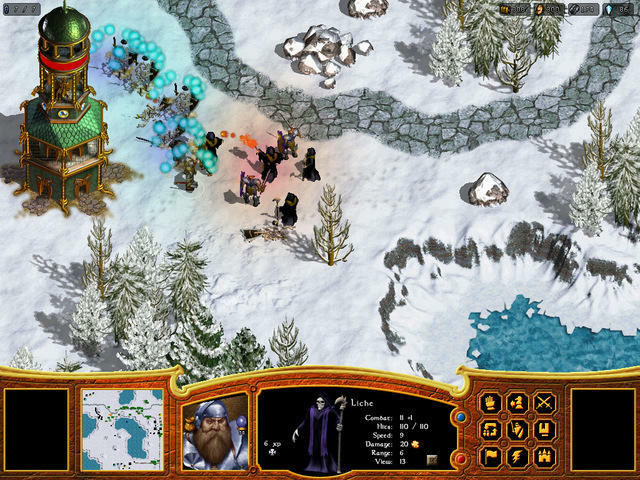 By making the hero a central figure, and by allowing the player to customize and develop it as they see fit, SSG has added a significant RPG element to the RTS genre. Your hero is a special unit during the battles as well. Heroes have the ability to convert mines to your side, increasing your resource production. Heroes can take on quests to gain items or special units and such. A hero also has a "command radius" which will increase the effectiveness of your units within that radius. Improving the hero's Leadership ability can increase this radius. When you kill an enemy hero, a treasure chest appears with items that you can wear on your hero to increase his power and abilities. Okay, but what happens if your hero dies? You can customize that gameplay option when you create your hero. You can pick everything from "normal", where your hero can die and you can still gain experience, to Tinman where death means no experience, to Bronzeman where death means you lose all experience down to the start of your current level, to the ultimate Ironman, where death is the permanent end of your character. The higher the difficulty level, the more experience the hero gains per battle. Units can also gain experience and levels along with the heroes. Every time a unit kills an enemy unit it gains an experience point. Other events can cause a unit to gain additional experience, sometimes a lot, such as killing an enemy hero. As units go up in experience and gain levels, you can chose to carry your best units along as part of your "retinue" from battle to battle. Special general and ally units can also perform some of the functions that heroes are capable of. Each race also has a special "uber" unit called a "titan" which varies from race to race. It takes a long time and a bunch of resources to build a titan unit and you can only build one per battle, but they are extremely powerful. Unfortunately you cannot carry the titan unit over to battle in additional scenarios; it must be built every time. The key to winning in WLBC2, like most RTS games, is controlling resources. Resources are required to build new structures and units or to upgrade structures or units. Heroes or generals are used to convert enemy or neutral resource sites over to your side. After a site has been captured it produces resources automatically. 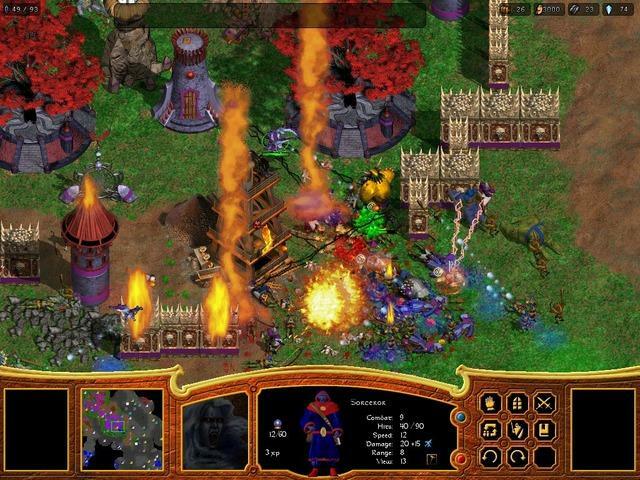 There is no need to use gatherer units like in Starcraft or Age of Empires, although a few of the races can place peon units in their resource sites to increase their output levels. Some resources of the four types are more important to certain races than others. This adds strategic depth to the game, as controlling those important sites will be important if you're playing that race, or denying it from enemies of that race will be critical to achieving victory. The interface for WLBC2 is very streamlined and easy to use. Two features stand out the most. The first is a continuous production queue on your buildings, which lets you generate units continuously while still allowing you to go in and temporarily interrupt the queue with things like building upgrades or the odd unit. Another nice feature is that the waypoint system lets you queue up unit movement and actions. You can also pause the game to issue orders and have up to 12 orders stacked. Friendly unit AI is excellent in WLBC2 compared to other RTS games. The game allows you to specify a custom "attitude" for each unit. There are 13 different attitudes you can give a unit, from Cowardly to Rampant, from Guardian to Scout. There are even attitudes that allow unit spell casters to use their spells automatically. You can also group your units into formations, which will be maintained as you move, moving at the speed of the slowest unit. By default, ranged units will gravitate to the rear of a formation while melee units go to the front. Enemy AI is also very good, and customizable for the Skirmish games. There are 6 AI difficulty levels, from Squire to Emperor. During a skirmish game you can specify each enemy or friendly AI and their competency level. The enemy AI will expand aggressively and also attack early on, keeping you occupied. The difficulty level of the campaign mode adjusts according to the power level of your hero. You can play skirmish battles, which will contribute to your hero's growth, as well as the campaign mode. The campaign mode involves conquering 47 out of 67 territories. You can continue the game after the enemies have sued for peace; the reason for this would be to get one of the powerful artifacts called an Orb of Etheria. As you conquer each area of the map, you gain special abilities based on that territory. The campaign is not entirely linear, because you can attack any adjacent territory and expand your empire as you conquer Etheria. While the production values are not quite state of the art, they are still quite good and do not detract from the excellent gameplay. At its core, however, WLBC2 is still a fairly typical RTS game, albeit a very polished one. If you're not a fan of the genre then this game isn't going to make you a believer, but RTS lovers should definitely give this game a hard look; it ranks up there with the best of them.